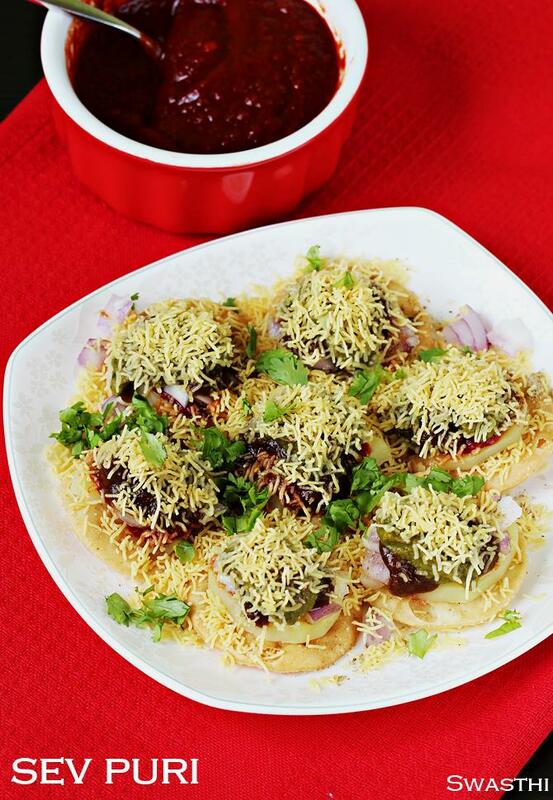 Sev puri recipe with video and step by step photos- Simple and delicious chaat recipe. 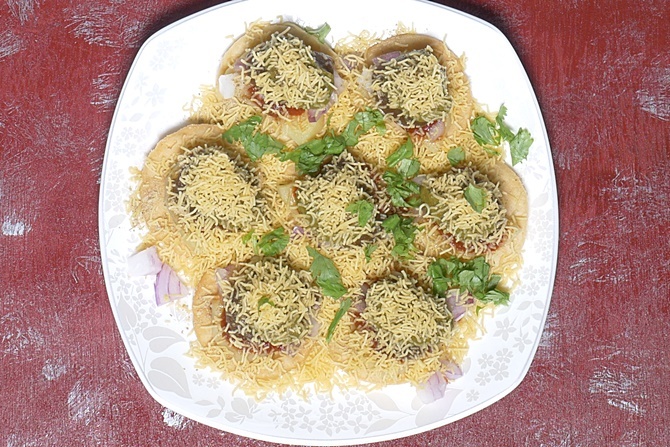 Sev puri is yet another street food popular across India. 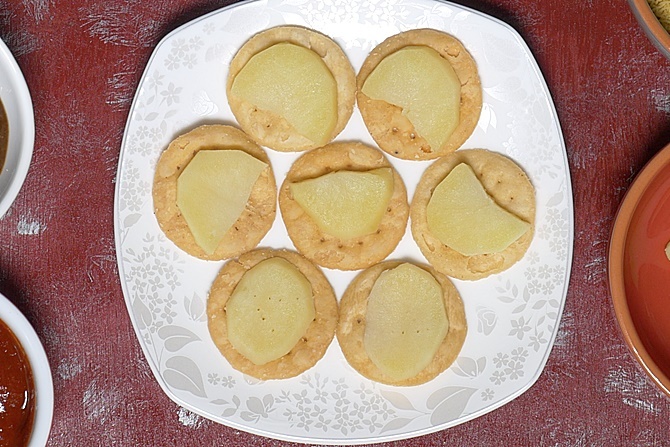 These delicious bites are made by assembling papdis/puris, boiled potatoes, onions and chutneys. 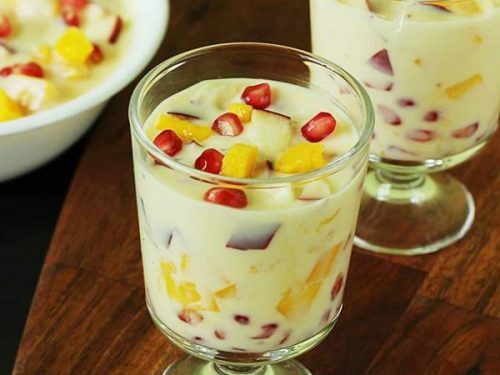 Topped with sev and chaat masala this is one of the most delicious snacks loved by all age groups. 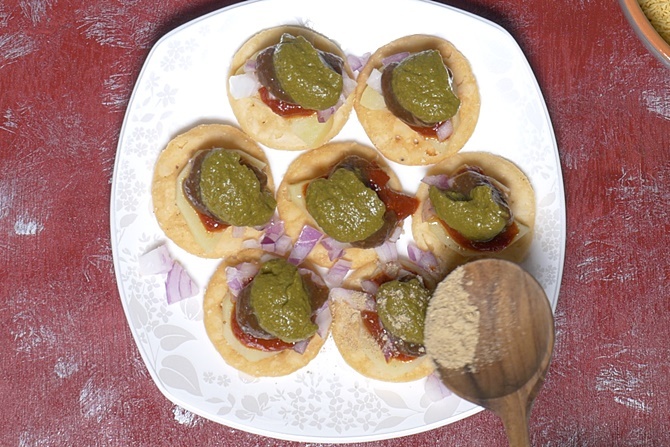 During these 2 weeks school vacations I am able to make some snacks and chaats for my kids. Thought of sharing this one as it is easy to make. After few failures to make good baked papdis at home, I decided to go ahead using the ready made papdis. 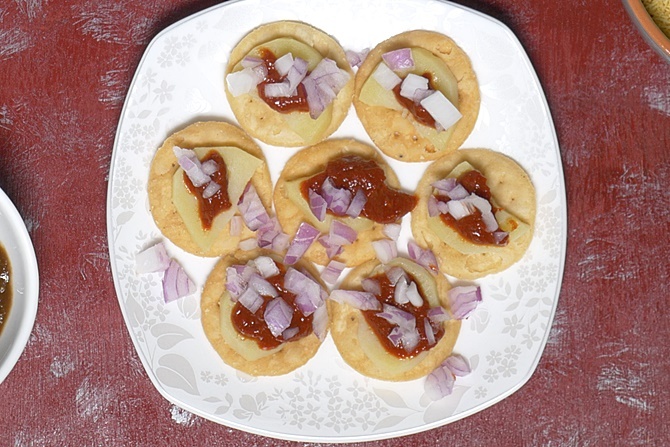 To make sev puri, all I had to do was just make fresh chaat chutneys and boil the potatoes. 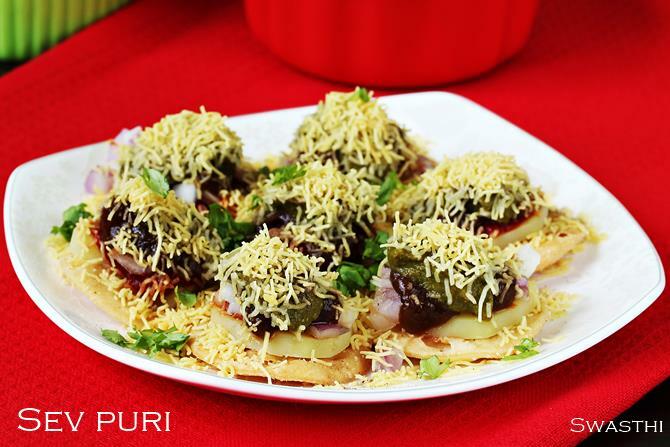 Sev puri can be had for a light evening snack and can also be served as a appetizer in kids’ parties. 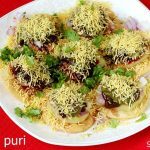 Mumbai sev puri is one of the street foods of India made with small puris, boiled potatoes and chutneys. 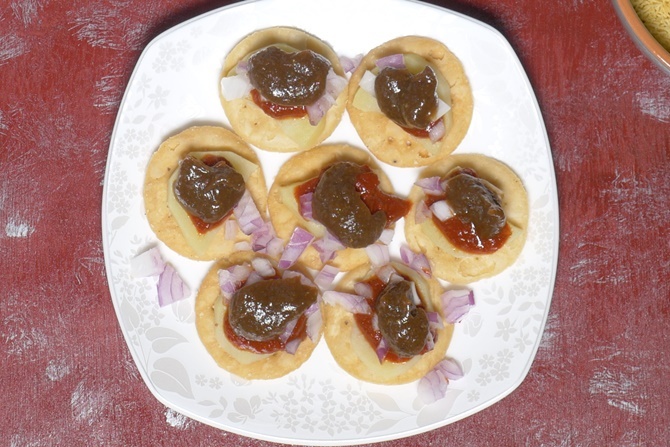 This recipe helps to make the best sev puri. 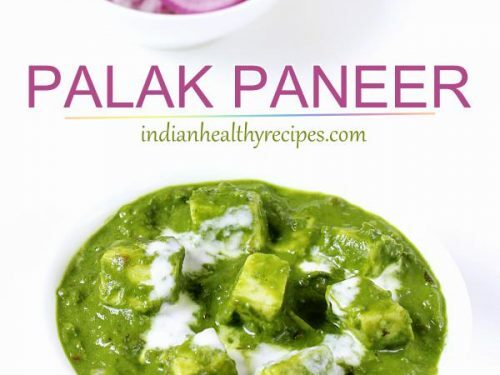 Add all the ingredients to make green chutney in a blender jar and make a fine paste. Add water as needed and make a thick chutney. Set this aside. Soak red chilies in very little hot water and set aside for some time. When they soften add them to the blender along with garlic, salt and sugar. Blend them together to make a fine paste adding water as needed. Set this aside. Add tamarind, jaggery, red chili powder, cumin , coriander powder to very hot water and allow tamarind to soften. Cool them completely and squeeze well. Pass this through a strainer. Add ginger powder and salt. Add more water if needed to bring it to a consistency. 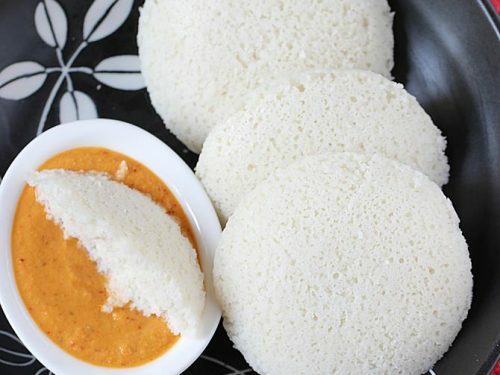 Place 6 to 7 papdis/ puri in individual serving plates. Slice or crumble the boiled potatoes and place them on each of the papdis. Add garlic chutney and then top with some onions. Top some tamarind chutney and green chutney on each of the papdis. Top with a generous amount of nylon sev. 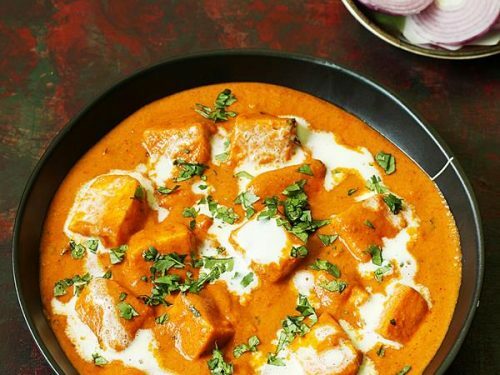 Garnish with some finely chopped coriander leaves. Make sure you make all the chutneys thick, they can be thinned down when needed. 1. To make red chilli garlic chutney, soak red chilies in some hot water. When they soften add them to a blender jar along with garlic, salt and sugar. Make a fine paste adding more water as needed. You can use the chilli soaked water to blend the chutney. Set these aside. 2. Making green chutney – Add all the ingredients to a blender jar. Add very little water and make a fine chutney. 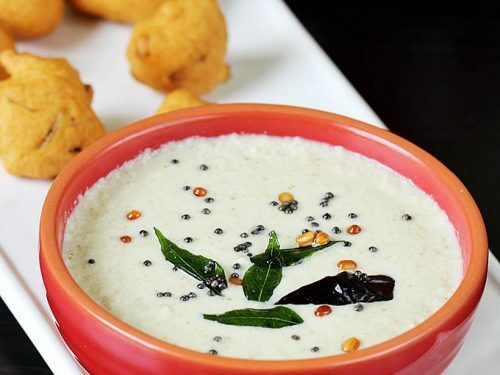 Set this chutney. You can also check this detailed post on green chutney. 3. To make tamarind chutney, place tamarind and jaggery in a bowl and pour very hot water just enough to cover them. Add red chili powder,salt cumin and coriander powder. 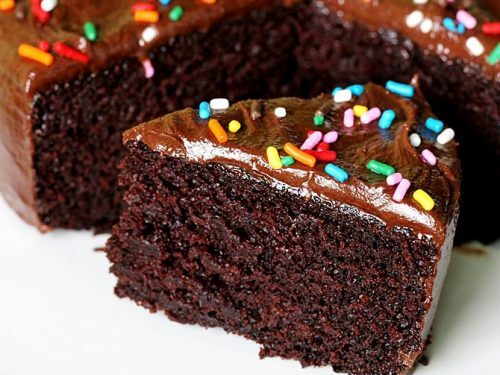 When the mixture cools down, squeeze well & pass it through a strainer. Add ginger powder and salt. Mix well and set aside. 1. 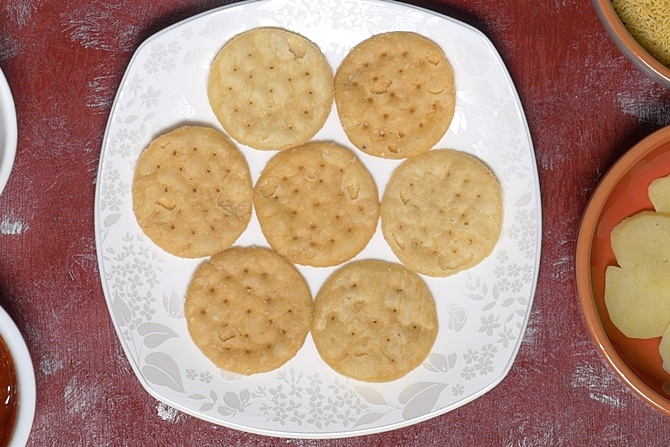 Arrange puris in individual serving plates. 2. Place sliced potatoes, you can also just crumble and add them. 3. Add a generous amount of garlic chili chutney. I prefer to make the chutney thick. 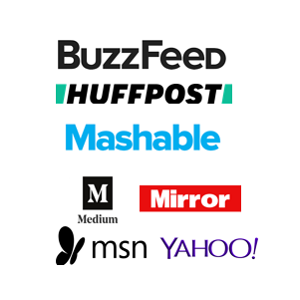 This prevents the papdis from turning too soft quickly. 4. Place some onions on each puri. 5. 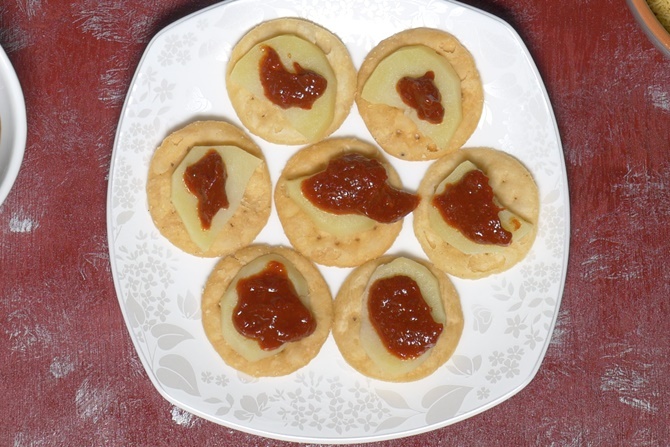 Top with some tamarind chutney. Same here I prefer the tamarind chutney to be slightly thick. You can add more water if you desire. 6. Then some green chutney on top. Sprinkle chaat masala. 7. Top with a generous amount of nylon sev. Sprinkle some coriander leaves.